BDU - Advances in agronomy. 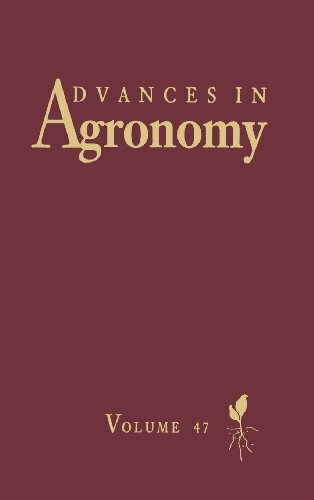 Advances in agronomy. edited by Donald L. Sparks. Effects of acidic deposition on forested soils / Wayne P. Robarge and Dale W. Johnson -- Fingerprinting crop varieties / J.S.C. Smith and O.S. Smith -- Transport of chemicals through soil, mechanisms, models, and field applications / William A. Jury and Hannes Fluhler -- Evolution of corn / Walton C. Galinat -- Use of surface complexation models in soil chemical systems / Sabine Goldberg -- Modeling the transport and retention of inorganics in soils / H.M. Selim. Environmental quality and biotechnology are ... two major research areas in the crop and soil sciences. [This book] is concerned with these topics. Three chapters deal with aspects of environmental quality. Chapters 3 and 6 examine modeling of organic and inorganic chemical transport in soils.... Many equilibrium-based models have been promulgated in the literature to describe reactions at the solid-liquid interface. One group of these models is microscopically based and is referred to as surface complexation models. These models are the subject of Chapter 5.... Chapters 2 and 4 deal with the crop sciences. -Pref. 00^aAdvances in agronomy.^nVol. 47 /^cedited by Donald L. Sparks. ^aSan Diego, Calif. :^bAcademic Press,^cc1992. 0 ^aEffects of acidic deposition on forested soils / Wayne P. Robarge and Dale W. Johnson -- Fingerprinting crop varieties / J.S.C. Smith and O.S. Smith -- Transport of chemicals through soil, mechanisms, models, and field applications / William A. Jury and Hannes Fluhler -- Evolution of corn / Walton C. Galinat -- Use of surface complexation models in soil chemical systems / Sabine Goldberg -- Modeling the transport and retention of inorganics in soils / H.M. Selim. ^aEnvironmental quality and biotechnology are ... two major research areas in the crop and soil sciences. [This book] is concerned with these topics. Three chapters deal with aspects of environmental quality. Chapters 3 and 6 examine modeling of organic and inorganic chemical transport in soils.... Many equilibrium-based models have been promulgated in the literature to describe reactions at the solid-liquid interface. One group of these models is microscopically based and is referred to as surface complexation models. These models are the subject of Chapter 5.... Chapters 2 and 4 deal with the crop sciences. -Pref.